Very nice photo! I love the colour, and the lighting compliments the photo. All natural lighting Judith. The colour of the surrounding flowers were purple - it was a good photo opportunity and I'm glad to have captured it. Stunning beauty, amazing detail, love color and DOF, voted in Color Purple ! Congratulations on your win! Fantastic photo! Lovely! Fantastic colour and detail! AWSOME SHOT.Please tell me what lens did you use for this shot?And is there any photoshop in this? Still love it, voted in Inspiring !! Wow wonderful capture! Congrats on being people's choice! Photo taken whilst everyone was still in their bed and the sun was just starting to rise. This photo was taken whilst on holiday in Hampshire, UK. It must have been around 5.45am or maybe even slightly earlier because no-one was around on the farm near the cottage we rented. Also, the cockerel in the yard outside liked to make himself known at around 6.00am each morning and he wasn't awake yet either! The light was very soft and beautiful and I didn't use flash as it wasn't necessary. Nikon D700; Nikon 135mm; f/2.0, 1/180 sec; ISO 100. Had to lean outside the sitting room window to capture this photo and as a result couldn't use a tripod. I therefore improvised by using the window sill and a photography beanbag to balance my camera whilst I took the shot. 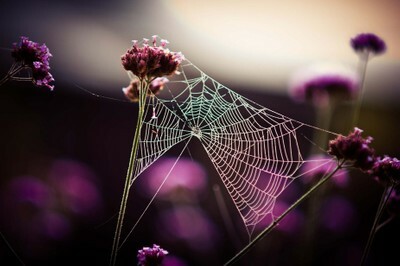 The web looked so delicate and beautiful. It wasn't quite complete but that didn't matter. I just had to capture this beautiful spectacle as it was! I can still remember taking this photo and that was almost 3 years ago now. Yes, I brightened the web slightly in Lightroom and darked the background to stand the web out against the background. I also added a little sharpening and clarity. Nikon D700, Nikon 105mm macro lens, Nikon 135mm lens, spare camera and speedlight batteries, spare memory card, Nikon SB900 speedlight, lens cleaning cloth, and an inexpensive JJC WB-F1 White Balance Filter which can be used with most lens sizes. To capture nature at it's best, you have to be prepared to rise early (often around 5am or earlier if you need to travel to a destination). The effort is worth the result however because the light just before, during and after dawn is really soft and beautiful... magical even! A fresh dew is usually forming at this time which tends to enhance spider webs and is therefore an added bonus, e.g. did you notice the little 'nature's diamond' in the centre of this web? Another thing to mention is always use a tripod or photography beanbag when photographing objects / nature, etc close up because they aid keeping your camera steady and as a result help to produce a nice clean and sharp image - especially if there's a breeze! One final comment - I shot the photo above using a low f/stop (f/2) which helped to focus on the web whilst it threw the background, which consisted of purple border flowers, into a beautiful soft bokeh.